Today, with the advance of augmented reality and virtual reality, serious games become as engaging and exciting as they can possibly get. Many industries can benefit from including an AR or VR serious game in its training program. Most often, serious games are used where practical skills play the key role – military, police, sports, civil and military aviation, healthcare. Rich graphics, precise controls, immersive experiences make AR- and VR-based games a great learning platform. Of course, planning a serious game in augmented reality or virtual reality should start with engaging a professional augmented reality or virtual reality app development company. In AR and VR apps, a lot depends on the quality of the product. For example, a poorly performing VR app can cause physical discomfort to players, such as dizziness, headache or double vision. Let’s look at the main points that should be considered during the development of augmented reality or virtual reality serious games. To be truly attractive and engaging, the game should have a valid story. When you immerse the player in a virtual world, they should know what this world is about, who are the good guys and the bad guys, what the main values are and what should be done to achieve them. In other words, the player should understand why they are there and what they are expected to do. The game story sets the basis for the entire game scenario. If your game is designed as a first-aid training tool, your story may be set around a paramedic team on duty that should save accident victims. In a team management game, you may place your team in a fictitious place full of challenges that the members should overcome to break free. For example, Pacific, the leadership training game we mentioned before, is set on a remote island where the leader is required to organize the team’s activities so that to finally escape in a hot-air balloon. 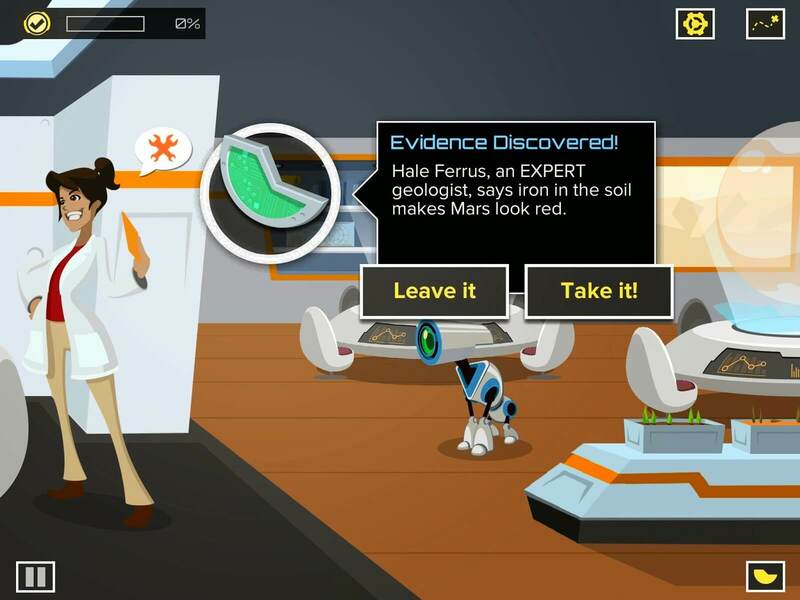 All game tasks are designed within this story making them exciting and engaging. There are some truly creative game stories aimed at training various skills and knowledge. 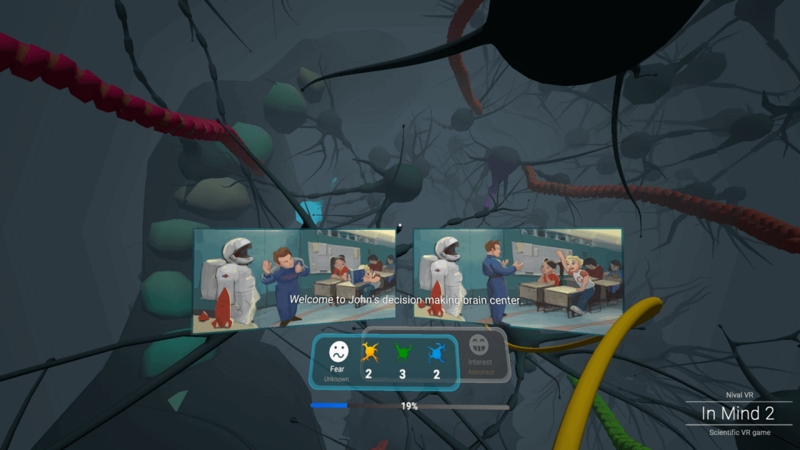 The goal of InMind VR, a game teaching the chemistry of the brain, is to help a teenager boy to shape his future by making important decisions. The decisions are based on certain emotions triggered by chemical reactions in the brain that you can control. Game characters are a part of its story. They should organically blend with the game world and, at the same time, be something players can relate to. A good idea may be to allow the player to choose the character and their features. Try to make the character as complete as possible designing their appearance, role, past history, personal traits. Such a complete profile will help the player to identify with their character and to understand their tasks and challenges better. Of course, virtual reality app development includes the creation not only of the player character but also the other characters they interact with during the gameplay. Here, the quality of graphic design, animation, dialog scripts is essential, as the interaction may be critical for the task performance and, ultimately, skill practicing. The creators of a VR game replaying the Titanic disaster and telling the complete story of the great ship sinking included about 800 of supportive characters building the full picture of that tragic day and adding to its atmosphere. The game allows participating in some diving missions discovering various artifacts and reconstructing the events that led to the Titanic catastrophe. Game mechanics is a broad term meaning the rules of the game. Depending on the nature of the game, its mechanics may refer to points, turns, achievements, roles, modes, level progress, inventory, etc. For example, game mechanics can prevent the player from jumping to higher levels without passing lower ones first. This way, the player masters the skills gradually and is better prepared for the challenges of higher levels. In augmented reality and virtual reality development, game mechanics are enhanced with the unprecedented motion and gesture possibilities. Interacting with game controls and elements via natural gestures gives unique flexibility and responsiveness adding to the immersive nature of the AR and VR technologies. When you learn in a traditional manner, most of the time you need to wait for your test to be checked and graded. In a game, you know immediately whether you hit the mark or missed, whether you completed the task within the time limit or not, whether you chose the right word, color or shape. Moreover, when the game supports the multiplayer format, your instructor may be in it next to you to provide feedback and evaluate your achievements. Advanced VR games can be played by several users at the same time. Thus, there is no problem with receiving immediate feedback. However, even if AR and VR games are designed for a single player, they still provide feedback right during the gameplay. For example, in a language-learning VR game where the player is placed in a world where everyone speaks a foreign language, they see immediately whether they have used the right phrase or word. Virtual simulators are the ultimate format of VR games. By placing the player in a space set up in virtual reality but reconstructing a real-world situation, simulators create the most effective learning environment. A simulator game, particularly when built for a hi-end VR headset and including supportive hardware, such as motion sensors and controllers, fully immerses the player in the scenario training them on a subconscious level. Multiplayer VR simulators add the sense of competition or teamwork urging players to plan strategies and assist each other. Such a format is often used in VR simulators created for the military or police, as they depend on teamwork heavily. The use cases of serious games are quite multiple, as essentially any business can benefit, for example, from a professionally created team management game. Military, where VR and AR simulators can be used for combat training, weapon handling, security operations, vehicle driving, etc. Police, where serious games can help in the same aspects as in the military. Aviation, where trainee pilots can learn flying aircraft on virtual reality simulators. Healthcare, where personnel of all levels, from paramedics to surgeons, can learn in augmented reality and virtual reality. Besides, do not forget AR and VR treatment and rehabilitation apps for stroke or trauma victims, autistic patients, etc. Sports, where virtual space can replace a shooting range, a tennis court or a boxing ring. Retail business that can implement serious games training personnel to sort goods, navigate stores and warehouses, serve customers. Education that speaks for itself. Enhancing any learning program with an AR or VR application will increase the learning efficiency tremendously. The most important step is to engage a professional development company. There are plenty of virtual reality and augmented reality companies on the market, but we recommend that you choose very carefully. Virtual reality and augmented reality application development take a lot of professional knowledge and expertise, as any flaws in the product will kill the effect. The development company will work with you from planning and designing the game including all its aspects – the gameplay, user experience, UI design – to deploying the final product and supporting it afterward. Make sure you discuss the key development aspects – the tools, virtual and augmented reality platforms that are going to be used – as they may have a significant influence on the game performance. If you are planning a virtual or augmented reality app development, contact us for a detailed project discussion. Our expert AR and VR developers will be happy to work on your project to create a unique educational game that is exciting and serious at the same time.